For men and women who want a convenient way to take care of their skin on the go, Nia 24 provides a handy little collection of products that help travelers maintain a rejuvenated complexion even when far away from home. Introducing the Nia 24 Deluxe Sample Kit: four miniature treatments that condition and protect the skin day and night, packed into a travel-size wallet for clean and easy transport. All products in the Mini-Deluxe Sample Kit contain pro-niacin, which strengthens the facial tissue by allowing the vitamin to penetrate and heal beyond the surface layer of skin. The kit includes a gentle cleansing cream, which removes dirt and makeup without drying the face. This cream moisturizes the skin with its light velvety texture, preparing it for application of the other treatments. The physical cleansing scrub cleans the face while smoothing and softening the skin, while enriching it with jojoba beads and botanical extracts, which help to gently exfoliate the face. The skin-strengthening complex is an anti-aging treatment that smooths fine lines and wrinkles, neutralizing the skin's pigmentation and improving its tone and texture. The strengthening complex is ideal for rejuvenating and improving the health of delicate facial skin. Lastly, the kit includes an SPF 30 sunblock, an oil-free sun damage protection formula that shields the face from both UVA and UVB rays. While protecting the skin, the sunblock continues to soothe and nurture the skin with additional vitamins and botanicals. All of the products in the Nia 24 Deluxe Sample Kit are 0.34 fluid ounces, large enough to take care of your skin for the duration of a vacation or work trip without taking up an excessive amount of room in your suitcase. The Deluxe Sample Kit allows travelers to enjoy the benefits of Nia 24's exceptional formulations while testing this exclusive product line. Once travelers can see and feel the benefits younger and healthier looking skin, they can opt to purchase larger sizes of the products included in the kit, as well as other skin reparation and recovery complex treatments that Nia has on the market. Nia 24's Niacin-Powered Skin Therapy is an excellent tool for ensuring that your skin receives the nutrients it needs, day and night. With airline travel, changes in climate, stress and environmental pollutants taking their toll, traveling can be rough on the health and complexion of facial skin. Nia 24 Deluxe Sample Kit is ideal for remedying and preventing outside factors from damaging the skin, while also working to improve the natural appearance of your complexion. 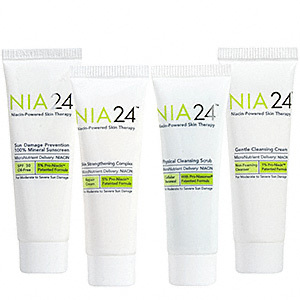 Visit Skincare Solutions store by clicking here, to view their entire line of Nia 24’s products.